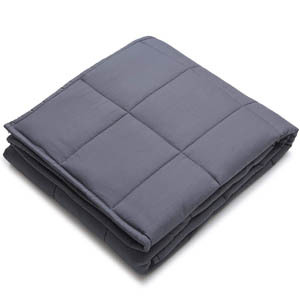 1.4 SensaCalm Weighted Blanket: Is It Effective? Do you really sleep well at night? If the answer is yes, you’re very lucky. Did you know that 50 to 70 million people across the United States have sleep problems? Insomnia is the most common sleep disorder, with 30 percent of adults reporting short-term issues and 10 percent with chronic insomnia. The emergence of weighted comforters on the market provided a therapeutic way for people with sleep disorders to manage their conditions. A lot of studies have been made to verify the effectiveness of these for many health conditions, including insomnia, depression, anxiety and more. I tried the SensaCalm Weighted Blanket to ease my insomnia, and I was pleased with the results. Read a detailed review of the product below to know if it’s worth the buy and whether it managed to find a place on our best comparison guide. There are many people who experience problems with sleep due to mental health issues and sensory disorders. These include anxiety, depression, obsessive-compulsive disorder (OCD), attention deficit hyperactivity disorder (ADHD), autism, insomnia, and post-traumatic stress disorder, among others. Many studies have shown how weighted throws have helped people with these disorders become relaxed and calm, promoting good quality sleep. It all boils down to the science behind the weighted blankets – deep touch pressure stimulation (DTPS). Deep touch pressure is a firm tactile sensory input that gives proprioceptive input throughout the body. This means that DPT gives feelings of being hugged, stroked, cuddled, squeezed, and compressed. When applied to the body, this method has a relaxing, calming, and organizing effect on both children and adults. The pressure applied to the body results in an increased level of endorphins. Endorphins reduce pain and at the same time, DPT promotes the release of serotonin, a neurotransmitter that functions in mood regulation and other brain functions. Low levels of serotonin have been linked to the development of various sensory processing disorders and mental health issues stated above. Serotonin controls the part of the brain responsible for sleep and the release of melatonin, a hormone that controls the body’s internal clock. Deep touch pressure also helps increase dopamine levels, which is a happy hormone that controls the pleasure or reward center of the brain. If there is an imbalance in the dopamine level, it can lead to aggression, addiction and risk-taking behaviors. Increased release and production of dopamine and serotonin counteract the effects of cortisol. This way it regulates the body’s response to sensory information. You can choose a custom or а ready-to-ship Sensacalm weighted blanket. I guess this is a good thing but if you’re not patient enough to wait for your custom blanket to be made, you might as well choose a ready-to-ship one. 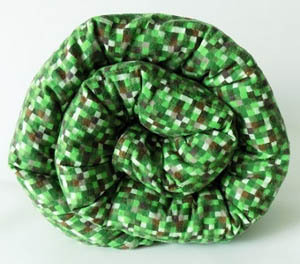 SensaCalm Weighted Blankets come in various weights, sizes, colors, and patterns. I like the fact that there are choices of patterns for children and teens. The customization of the Sensacalm will make them feel really comfortable and at ease. Aside from a wide array of patterns and colors to choose from, they offer various textile materials, depending on what makes you feel comfortable. Plus, they have various sizes ranging from small, medium, and adult, to full sized and queen-sized blankets. The weights also vary, depending on your body weight. If you prefer a custom-made one, you need to compute for 10 percent of your body weight to determine which size is suited for you. Figure out the right size by considering your weight, body size, and the size of the bed. This way, the blanket is perfectly snugged at night, without its edges falling out of the bed. What I like most about the SensaCalm Weighted comforter is it has customization options, so you will feel that it’s really made for you. In terms of build quality and materials, the weight is evenly distributed, giving the same deep pressure no matter which part of the cover is touching you. 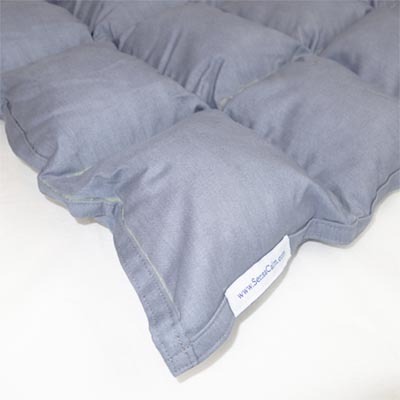 The blankets contain 100 percent virgin polypropylene pellets that are non-toxic and hypoallergenic. 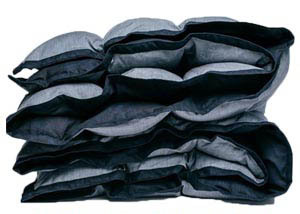 You can also wash the blanket or dried at home or commercial dryers without the pellets melting or coming out of place. Another plus point for this product is that it uses a poly-fil, which adds cushion to it. It reduces the sound from the pellets and provides added comfort at night. The pellets are enclosed in individual pockets that are sewn to make sure they won’t go out. The Sensacalm product can be really durable and long-lasting if you properly take care of it. Lastly, the material used is 100 percent cotton, making it extremely comfortable and breathable. SensaCalm Weighted Blanket: Is It Effective? I ordered the full size from SensaCalm and honestly, it’s way better than the other weighted blankets I’ve tried in the past. With price tags ranging from $109.95 to $249.95 at the time of this review, I can say that it’s competitively priced but not cheap, unfortunately. The quality and build are well-made, which means that it is well worth my money. In terms of my sleeping problem, it took me about two days to adjust to the weight of it. But, overall, I slept soundly at night. I noticed that it took me faster to fall asleep, compared to when I was using an ordinary comforter. I slept for straight 8 hours on my third night and woke up feeling refreshed and better than ever. I can say that the SensaCalm helped me a lot over the few weeks I’ve used it because I slept quicker and better. I don’t experience waking up as if I never slept, groggy, lazy, and with a brain fog. I performed better at work, I had no daytime sleepiness, and I was more focused on the things I do. Overall, it’s a really effective product. My final verdict – worth the price! I was quite impressed by the company’s customization options that can cater to all ages – from kids to adults. The build quality is impressive and you can have a product that has the perfect weight for you. You don’t need to adjust the weight with inserts since it’s really made for you. The SensaCalm Weighted Blanket is one of the best products I’ve tried so far. Plus, it’s totally washable without the threat of pellet leakage. I recommend it wholeheartedly for those who suffer from insomnia and other sleep problems. I had the best naps of my life, thanks to the SensaCalm. Overall, highly recommended!